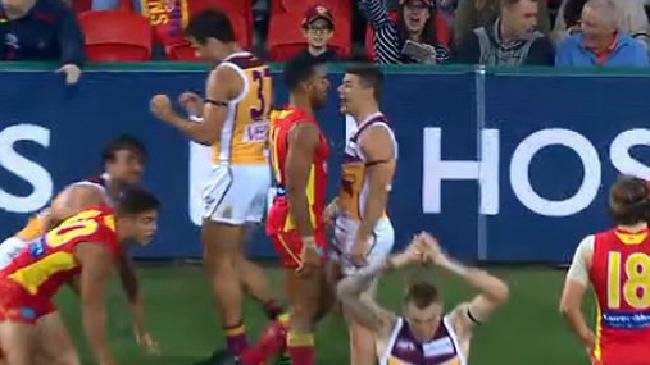 Dayne Zorko and Touk Miller were involved in a heated exchange after the siren. 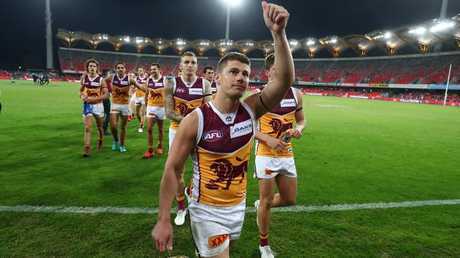 BRISBANE captain Dayne Zorko has been slammed for his heated post-match exchange with Gold Coast midfielder Touk Miller with one AFL great describing it as a "disaster". The Lions midfielder then extended his hand to shake Miller's hand, which he reluctantly did before firing back as the pair continued the heated exchange. The pair have a frosty recent history after Zorko refused to shake Miller's hand following the Round 5 QClash, which the Suns won by five points. Western Bulldogs great Brad Johnson said if he was Miller he wouldn't have accepted the handshake from Zorko following his actions. "It's a disaster, it's a disaster from Zorko," Johnson said. "If I was Miller, you know what? I wouldn't have shaken his hand after that. "And look at him coming back, it's just no good. Miller's over him by this stage, he's just won the game, shake it once, go and celebrate with your teammates." Hawthorn champion Dermott Brereton also said it wasn't a good look. "His coach will tell him off for that, no doubt. No doubt whatsoever Fages will tell him off for that, he'll pull him into line," he said. Former Sydney hard nut Jude Bolton also weighed in. "He didn't cover himself in glory," Bolton said. "He needs to be humble and move on. "There's been a bit simmering away between the two." Zorko had 17 disposals and laid nine tackles in the victory, while Miller managed 25 disposals. "I just said thanks for the game mate and shook his hand," he said. "He did really well again tonight so good stuff. Fortunately this time we were able to turn the tables and got a really hard-fought win." Brisbane coach Chris Fagan wasn't asked about the incident post-match but praised Zorko for his performance and ability to work through the hard tag. "I thought Zorko worked his backside off tonight and he ended up with more of the ball than the bloke that was playing on him and he had nine really important tackles," he said. "I thought he never stopped trying. "Yeah, it wasn't a dominant performance by him but his contribution was still important."